Carpenter ants are among the largest species that you will find in North Carolina. Like other ant species, carpenter ants are social, i.e, they live in a colony and have several "castes" or adult forms that perform different jobs in the colony. The queen usually reaches 9/16 inch in length. The workers range in size from 1/4 to 7/16 inch. So, if you see different sized ants, they could all be from the same colony. All of these ants are adults regardless of their size, so they do not grow. Only the queen produces offspring in the nest. Immature ants (larvae) are white, legless, and maggot-looking in appearance. They remain in the nest and are fed by the workers. The larvae develop into pupae, which are tan and capsule-shaped. Eventually, new adults emerge from these pupae. Adult ants will vary in color depending upon the species. The black carpenter ant, the species that most commonly nests in homes, is primarily black in color. 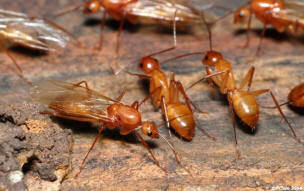 Other carpenter ant species may be more reddish-brown to yellow in color. 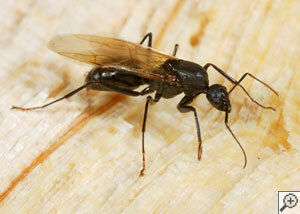 In the spring, carpenter ants swarm, i.e., winged adults emerge from the colony. The swarmer's sole purpose is reproduction. Shortly after mating, the female (queen) loses her wings and searches out a cavity in wood or soil where she begins to lay eggs and produce her colony's first workers. These workers care for the queen as she produces more offspring, and they assume the tasks of foraging for food, maintaining and expanding the nest, and caring for the young. After 3-6 years, the colony will contain 2000-3000 workers, and will start to produce swarmers. The swarmers are actually produced in the fall, but they wait until the following spring to emerge. Swarming is not the only means for carpenter ants to produce new nests. "Satellite" colonies may be formed by workers that move out of the main nest, carrying larvae and pupae with them. Eventually, these secondary colonies produce their own reproductives. Unlike termites, carpenter ants do not eat wood; they tunnel through wood while building or expanding their nests. Typical outdoor nesting sites include tree holes, tree stumps, logs, standing dead trees, and planter boxes. When conditions are suitable, carpenter ants may establish nests indoors. Typical indoor nesting sites include structural wood, wall voids, attic areas, insulation (foam or fibreglass), hollow doors, window/door casings, voids beneath kitchen/bathroom cabinets, as well as hollow beams (e.g., decorative beams that may cover pipes or girders. In the case of carpenter ant species that nest in existing cavities, the workers may subsequently invade and damage nearby structural wood while expanding their nest site. The ants often invade homes through cracks and crevices in the foundation masonry, around windows and doors, through foundation, as well as heating/AC vents. They may travel along tree limbs or shrubs that touch the siding and roof, gaining access to attic areas. Telephone, electric and cable TV lines also provide ready means of entering the home. When the ants invade homes, they usually seek out sweet items, such as sugar, but they also will feed on fats, grease and meats. Water is also important to the ants. Outdoors, you will often find ants collecting water dripping from water spigots, gutter downspouts or air conditioner drain lines. Indoors, the ants are often seen near sinks, bathtubs and dishwashers.